From the #1 New York Times bestselling author…“Remember Getting to Happy, Waiting to Exhale, and How Stella Got Her Groove Back? 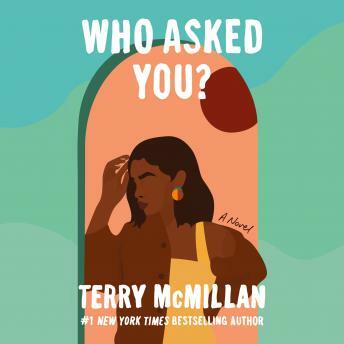 Well, you won’t likely forget Terry McMillan’s Who Asked You? either” (Raleigh News & Observer). When Who Asked You? begins, Trinetta leaves her two young sons with her mother, Betty Jean, and promptly disappears. BJ already has her hands full dealing with her other adult children, two opinionated sisters, an ill husband, and her own postponed dreams—all the while holding down a job delivering room service at a hotel. Her son Dexter is about to be paroled from prison; Quentin, the family success, can’t be bothered to lend a hand; and taking care of two lively grandsons is the last thing BJ thinks she needs. But who asked her? So glad I read this book. I enjoyed it beginning to end. This book was awful. The conversations trite and the "all live happily ever" after was boring. The characters are poorly developed and, Teri, would Luther at 8 years old really know about a woman's eggs drying up or at 14 to tell Omar to be a man? I think not. Phylicia Rashad was the only bright spot. This is a great book. I really enjoyed listening to it. The narration was really good. I loved every second of getting to know the characters in this book. Terry McMillan has a way of making the characters come alive as people in your every day life. I'm so glad I got it as an audio. The narrators added even more to this fantastic book. Terry McMillan can always draw you in with her characters. Another great book! Loved hearing this book on Audio. Phylicia Rashad's voice was so comforting to listen to. Absolutely the best book I have listened to all year! Terry McMillian did an awesome job with this novel. The characters were bold and witty. There was never a dull moment, full of humor, insight, and great depiction of everyday trials and triumphs. Loved it!